The bodhisattva Samantabhadra, who symbolises the infinite wisdom of the Buddha, sits upon an elephant. The painting originally formed part of a triptych, with Sakyamuni Buddha in the centre, Manjusri (bodhisattva of universal wisdom) seated on a lion on the left, and Samantabhadra on the right. Because at some point in its life the scroll has been cut down, the position of Samantabhadra now appears off-centre, and his halo is incomplete. 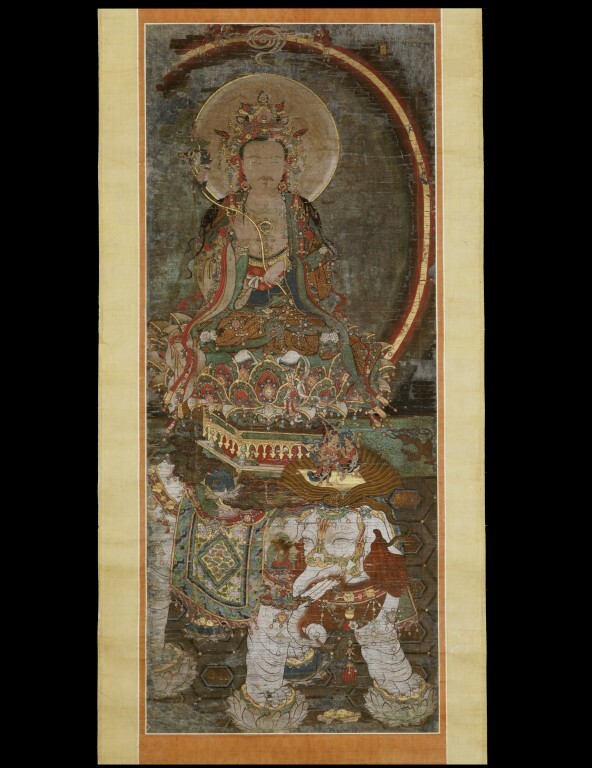 Executed in water-based colours and gold on silk, the painting is now mounted on paper, and attached to narrow silk border. Samantabhadra wears the princely robes of a bodhisattva and a highly ornamented crown bearing a flaming pearl, his attribute. He holds a gilded lotus stem topped with a blue lotus blossom. A platform on the elephant's head supports three figures representing three personifications of the Buddha, while a group of celestial musicians sits on one of the elephant's six tusks. A saddle cloth decorated with clouds and flowers covers the elephant's back, numerous jewels and pendants adorn his harness and trappings, and his feet rest on lotus pedestals. 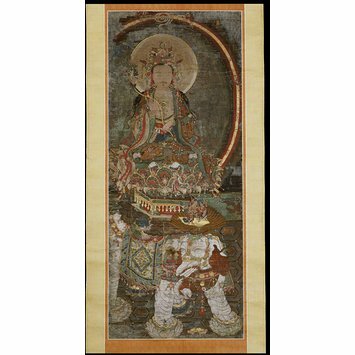 A devotional image of great power, this painting of Samantabhadra is a remarkable survival from mediaeval Korea or China. The scroll depicts the bodhissatva Samantabhadra, who symbolises the infinite wisdom and absolute or fundamental law of the Buddha. Samantabhadra is shown in characteristic fashion seated upon an elephent. It is apparent that the painting originally formed a triptych, comprising Sakyamuni Buddha in the centre, Samantabhadra on the right and Manjusri on the left. The scroll has been reduced in size, probably owing to severe detrioration around the borders. Consequentially, the deity no longer occupies the centre of the scroll and is instead slightly left of centre and the halo on the leftside now extends beyond the present limits f the scroll. The painting is executed in water-based colours and gold (or kirikane) on silk. The silk ground is mounted on sturdy handmade paper and the present mounts comprisea narrow tan-coloured silk border surrounded by an ochre silk paper mount. The roll is ornamented with gilt mounts decorated with incised floral scroll designs. The deity sits , with legs folded, facing the viewer straight on, unlike Chinese and Japanese counterparts which typically adopt the three-quarter view. The figure wears the princely robes of a bodhisattva and a highly ornamented crown which incorporates the cintamani, the flaming pearl, which is the attribute of Samantabhadra.The figure holds a gilded lotus stem topped with a blue lotus blossom. The lotus throne upon which the figure is seated, which is set on a dais and supported by a cushion of clouds on the elephant's back, is highly decoratively conceived, in line with the Korean provenance. A small platform on the elephant's head supports three figures representing three personifications of the Buddha: the figure on the left holds a cintamani, the central figure , the vajra and the figure on the right the wheel of the law. The six-tusked elephant is covered with a cloud and floral covered saddlecloth, and has trappings decorated with monster masks in the Chinese style and sundry pendants and jewels. The four hooves stand on lotus flowers. The elephant's tusks also support a group of celestial musicians sitting on clouds and beneath an image of the Buddha which is partially obscured by damage. The scroll has a fitted box on the cover of which is written "Fugen no zo (The image of Fugen) and "Myoko-an" (probably a Japanese temple name). John Ayers. Oriental Art in the V&A. London: Scala/V&A/Philip Wilson, 1983. 40. Edmond Capon. 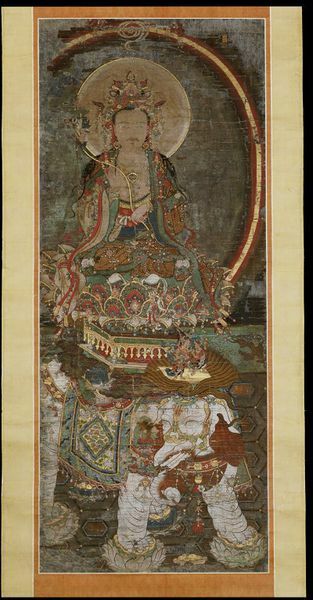 "A Koryô painting of Samantabhadra."
. London: Oriental Art XXV.1, 1979. pp.74-80., figs.1, 2, 3. Beth McKillop. Korean Art and Design. London: V&A, 1992.